Sam: Go on. Now! Throw it in the fire. Frodo: The Ring is mine! Sorry for posting so early, but I’m away for the weekend! Perfect choice for the silver theme. I love these rings! Have a great time this weekend Janet. You are Ms Social Butterfly! This has nothing to do with the silver thing – I’ve just got back after a week away so didn’t want to post where you wouldn’t read it! I totally agree about Dumbledore #1 – a real shame theat Richard Harris died as his voice was just excellent for the part. And Snapey…..yum. Enjoy your weekend away! 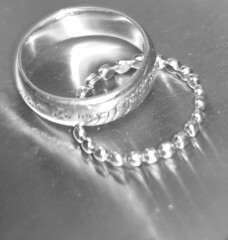 I love the picture, but I am of course very biased considering that as I sit typing this I am wearing the One Ring. That’s strange. I thought I was wearing it, and mine’s gold. I love it, what a great choice! Well it’s Saturday afternoon here so your not early for my part of the world. Lovely photo. Happy weekend. LOVE the commentary along with your silver rings!!! Mine’s posted. Drop by if you can. One of the best parts of the book, and I guess the movie! Great take on this weeks theme. Hope your weekend is fun! My silver is up. Happy Saturday! You say early ??? It’s already 5 am ! at least here in my little corner of the globe. The rings are nice, I love the style. Have a very good weekend ! Great entry with matching words. These are beautiful rings. Wasn’t able to join the Photo hunters. I was at a loss when I was going to post and all of a sudden I couldn’t open my own blogger as I was switched to the new blogger buzz and not the blogger beta. They said blogger beta is already dead and this is the new one. So anyway, no Photo Hunter today but have something special for everyone. It is much better than silver and gold. Please do visit if you have the time. Everyone else seems to have the ONE ring. I would lover to have ONE, even a silver ONE. But if there are so many of the ONE ring, doesn’t it become less than special, or rather it will make a much bigger explosion when all are dropped into the Mountain of Fire at the same time.